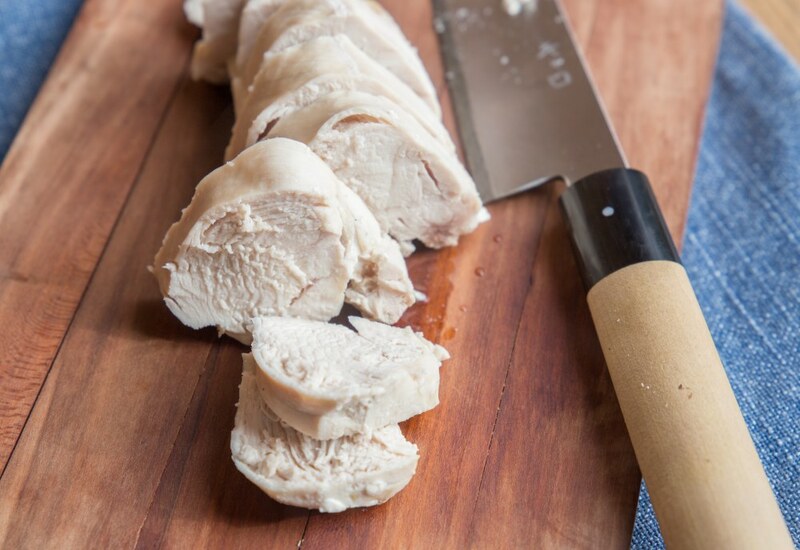 Get perfectly poached chicken breasts in just a few minutes using your pressure cooker. This recipe provides a great healthy protein for adding to soups, salads, or to really any dish calling for cooked chicken. Try using shredded poached chicken in a tortilla as a building block for tacos. Or maybe cube the chicken and stuff it with vegetables and tzatziki sauce inside a pita pocket. The possibilities are endless! Make a batch of pressure cooker poached chicken breasts at the beginning of the week and you will have a versatile ingredient ready to go for meals. Season chicken with salt; lay in the pot of a pressure cooker. Pour water around the chicken. Seal lid on pressure cooker, turn steam vent to Sealing, and cook on High Pressure for 6 minutes. Allow pressure to release naturally for 10 minutes before turning steam vent to Venting to Quick Release remaining pressure. Add your favorite aromatic herbs to the liquid in the MultiPot to infuse a wide variety of flavors into the poached chicken. You can also substitute chicken broth for the water in this recipe for an additional flavor boost. Per Serving: 198 calories; 4g fat; 0.0g carbohydrates; 37g protein; 102mg cholesterol; 358mg sodium. I did this for soup over the weekend. The meat shreds perfectly, which is pretty much my standard for poached chicken. Would work well in a chicken salad or on wraps or whatever sandwich you like. Definitely a good standard for your kitchen work. I love poached chicken for recipes where I just need really bland chicken. This chicken shredded perfectly, so it's great for this Vietnamese chicken salad I make where I wouldn't want the olive oil, salt, and pepper needed to roast chicken to overpower the flavors. Really good, moist, perfectly cooked. I use this method of cooking all the time, but this was my first time using a pressure cooker! It cuts the cooking time down drastically. Love how easy this is. I poach chicken breasts regularly at my house, but this pressure cooker version is by far my favorite method. It's so easy and the quick cooking time is phenomenal. When I discovered poaching it changed my life! I added a little onion and dry white wine to this recipe, it makes tender, delicious meat! This is a fantastic method...I tweaked a bit to add tons of flavor. Here's what I do: sprinkle chicken with kosher salt. Coat bottom of pot with avocado oil or olive oil. Using saute function, brown the meat nicely. Add a splash of white wine, season the chicken well with whatever spices you like and cover with 1 cup water. For chicken tenders I cook only about 4 minutes, 10 minutes for regular breasts. Enjoy! All chicken breasts are not created equal. I’ve seen some that weigh over a pound. It would be nice if you would include a chart showing how long to cook different sizes/weights of breasts. So this was absolutely delicious. Instead of using plain water I mixed some of my favorite seasonings with the recommended amount of water. The chicken was juicy tender and delicious. It soaked up the seasonings. The cook time was perfect. I didn't measure the chicken per individual size, so I guess I got lucky. Super delicious! I didn’t use chicken but turkey tenderloins. They came out juicy and tender and easy to shred!! I’m loving my pressure cooker! It has amazed me on 3 dishes I made in one night.